Needle felting is something I do not enjoy. It's too time-consuming and physically exhausting. When I hear about this product called Artfelt® Paper, I thought I'd give it a try. While I was at it, I also tried a simpler, quick and dirty way of felting. Both turned out with some very pleasing and surprising results. 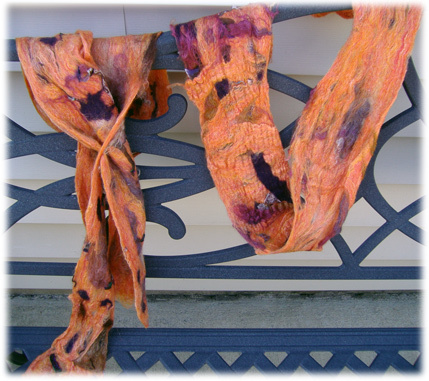 The scarf and the left was created using Artfelt® Paper. It is very soft and drapey. The one of the right was created using only cheap plastic wrap. I used Michele Johnson's instructions on YouTube. when I took it out of the dryer. as I did with the Artfelt® Paper. I also plan to try a water soluble stabilizer instead of the Artfelt® Paper. The best thing is that both scarves were completed in less than two hours. This will also be a great way to use up a lot of wool roving I've bought. Then I can buy more.